Jack Conklin missed last week's game but could be in the lineup this weekend. After finishing last week's win over Purdue with a makeshift offensive line, there have been signs early this week Michigan State will be able to run out something that looks more like the original starting lineup this week against Rutgers. 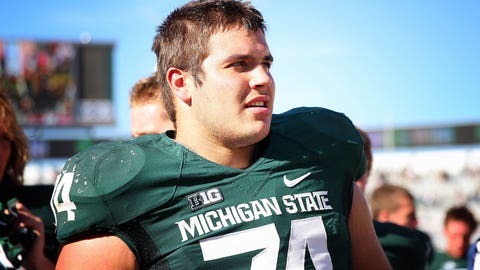 SpartanTailgate reports MSU offensive line coach Mark Staten told reporters that Jack Conklin and Kodi Kieler — the starting left and right tackles, respectively — both practiced Tuesday. Keller has not played since going down in week two against Oregon while Conklin went down two weeks ago while the Spartans were beating Central Michigan.